BACKGROUND: A Registered Counselor (KB, PA) with more than 15 years of experience. A holistic wellness practitioner in Malaysia for more than 5 years. EXPERTISE: Holistic Wellness Counseling, Employee Wellness Program (EWP), Employee Assistance Program (EAP), Organizational Consultation, Assessment & Customized Intervention, Critical Incident Stress Management, Psychological Intervention for Adolescents, Adults, Couple & Family, Supervision & Teaching. CHEE SIANG is one of the founders and a Director of TURNING POINT INTEGRATED WELLNESS SDN BHD. He is a Malaysian Registered and Licensed Counselor (KB, PA), obtaining a double Master Degree in Guidance & Counseling (2000) and Human Resource Development (2004) from Universiti Putra Malaysia (UPM) and PhD in Guidance & Counseling (2010) from Universiti Kebangsaan Malaysia (UKM) in the area of Holistic Wellness. His career in counseling began in 1996 when he became the Counseling Department Head in United Chinese School Committees’ Association of Malaysia. Subsequently, he started his counseling practice in Soulcare Personal Wellness and Development Center, Kuala Lumpur. His work ranged from providing counseling to individual, family and specific group, to conducting training and public talks targeting the larger community. Later his work evolved into teaching where he lectured in New Era College and Universiti Kebangsaan Malaysia (UKM) in the various area of counseling e.g. career group supervision, Life Education, Theories and Practicum. Has two books under his belt. His first book on youth career development was voted as one of the ‘10 Most Popular Youth Books’ by the local press in 2005. His second book is on Life Coping Skills. He is also an active columnist with various Chinese presses like Sin Chew Jit Poh, Nanyang Siang Pau, Oriental Daily, China Press and other magazines. He makes regular appearances on television and radios programs such as INFO FOKUS TV 2, 8TV’S, NTV7, ASTRO, AI FM RADIO PROGRAM, AI FM FILM APPRECIATION PROGRAM, ASTRO MY FM PROGRAM, 988 U-LIFE FAMILY PROGRAM. He hosted a 13 episodes TV Talk Show with TV2 entitled “Young Angel” focusing on teenagers’ physical, mental and emotional development. CHEE SIANG currently focuses on EWP, EAP, consulting, coaching, training, counseling, supervision and teaching. 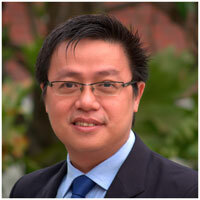 The past few years, CHEE SIANG has worked with a whole range of corporate and public clients in the areas of training, consultation and Employee Assistance Program (Motorola, Freescale Semiconductor, Shell, Panmatex Trading, Precision Control, Pelangi Publishing Group, Selangor & Federal Territory Hainan Association Malaysia, Klang Chinese Chamber Of Commerce & Industry etc.). He is also a Certified Trainer of HRDF (PSMB) of the Ministry of Human Resources. Appointed Trainer in Counseling Supervision under National Counselor Board of Malaysia. CHEE SIANG speaks fluent Mandarin, Bahasa Melayu, English and Cantonese dialect. He volunteers actively in various non-profit organizations by giving mental health-related talks and providing training in counseling skills to volunteers. He had travelled to many countries like Thailand, Singapore, Taiwan, China, Hong Kong and Japan.